The secret to a smooth, contoured and impeccable lawn grooming is by using a good finish mower. This is why most lawn care professionals recommend Bush Hog finish mowers. 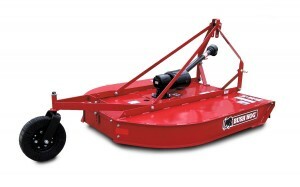 Bush Hog finish mowers have become a must have accessory in most government entities, homeowners, property owners, and also in most agricultural applications. Perhaps, Bush Hog finish mowers are not only adored due to their quality performance but also the durability and years of service they provide. 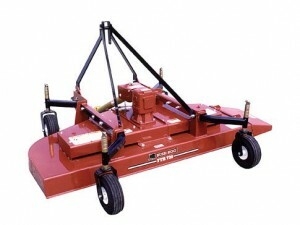 There are various models of Bush Hog finish mowers to choose. Selecting the best model is beneficial in enjoying a superior mowing performance. Here are the three Bush Hog finish mowers recommended for flawless performance. The Bush Hog RDTH72 finish mower comes with a 72-inch cutting width and is designed to deliver smooth and even cut every time it is used. Its lower link and floating top help to provide a uniform cut even when used in areas of uneven terrains. It is also equipped with real solid rubber wheels that make the unit remain sturdy when cutting grass and minimizing the need for repairs and having to spend money on Bush Hog finish mower parts. Moreover, the rear discharge on the Bush Hog RDTH72 finish mower significantly improves the overall performance of the unit by providing superior distribution. The rear discharge also has a chain shielding that helps prevent it from damages from debris and other rocks available in the cutting field. 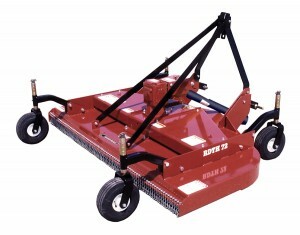 The Bush Hog FTH720 finish mower is a 72-inch finish mower that provides seamless cutting performance. With a blade tip speed of about 18,272 FPM, Bush Hog FTH720 finish mower eliminates the problem of blade streaking that is common with other brands. It also has a flared deck, and a closed box design helps protect it from damages that come from thrown stones and other rock debris. The cutting height on the Bush Hog FTH720 finish mower is easily adjustable meaning users can enjoy a custom lawn care that matches their individual needs. The three cutting blades are sharp and sturdy hence will guarantee an even cut. Its pneumatic tires add stability to the unit making it safe and reliable to use for easy lawn maintenance. The Bush Hog RDTH60 finish mower is a professional mower that has fine half-inch cutting height adjustments ideal for custom mowing. It also has a fabricated 7-gauge sturdy steel deck plate that is durable easy to use in various types of landscapes. For easy adjustment of belt tension, Bush Hog RDTH60 has a spring loader idler that is easy to customize. The Bush Hog RDTH60 finish mower is a unit that is sturdily constructed to withstand wear and tear while delivering the best quality cut. The spindles can be greased with ease to add flexibility. It is also equipped with high-quality genuine Bush Hog cutting blades that provide an excellent cut in one swift. A good finish mower guarantees superior mowing experience. Bush Hog finish mowers are trusted for durability and reliability in lawn care and maintenance. They come with a limited warranty of one year and a 5-year warranty for the gearbox. They are also available in a vast range of tractor colors so that most buyers can choose based on their preferences. Reviewed above are the three renowned models worth every purchase.